WESTLIFE News Time! We all know that Westlife is definitely going to Manila on September 29, 2011... but does everyone know that there are two contests out there right now that are giving you a chance to meet them? Yeah. Putting that aside, I'm still here to give you updates regarding the concert. So I also made a video about it, but I'll just paste the details I have entered in my video's description box. - Astroplus has a contest, so check their Facebook Page for the complete details. Click this for the fanpage. PINOY LIFERS! Will you let this rare chance go? It's your chance to MEET AND GREET the lads of WESTLIFE! Even take home a Westlife standee or tickets to their concert here in Manila! Don't miss this chance! Join now! 1.Every purchase of participating Westlife CD / DVD at participating Astroplus / Asrovision stores entitles the customer to one raffle coupon. 3.Fill-up the raffle coupon with your name, age, complete address, contact number, and e-mail address and drop it in drop boxes located at the counter. 6.Claim your raffle coupon at the counter and fill it up with your name, age, complete address, contact number, e-mail address, concert ticket number/s and drop it in drop boxes located at the counter of participating stores. 7.Every album purchase and every concert tickets is equivalent to one entry. Concert tickets shall be stamped upon availing raffle entry. 9.A participant can win more than once. 12.Winners shall be notified through call, and registered mail. 13.To claim prizes, winners must present a valid ID, their official receipt and raffle stub. 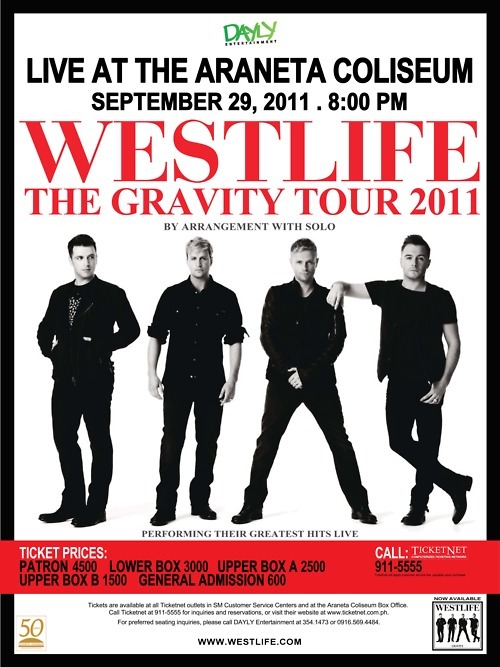 Meet and greet winners shall meet Westlife at the Araneta Coliseum on Sept, 29, 2011 6:00 p.m.. Concert ticket winners can claim their tickets from September 23 – 29 at Astroplus Podium during mall hours. Standee winners can claim their prize from September 31 – November 31 at Astroplus Podium. 14.Employees of Astroplus, Sony Music Philippines, Ivory Music and Video and Dayly Entertainment and their relatives up to the second degree of consanguinity is disqualified from joining the promo. Step 1: Purchase any Westlife album in any Odyssey Music & Video store nationwide. Step 2: Take a picture of yourself holding the album plus your other Westlife merchandise and email the picture to Promos@Odysseylive.net with your name, email address, contact details, a clear / readable scanned copy of your Odyssey receipt and in NOT MORE THAN 5 sentences, convince us why you deserve to win the Meet & Greet opportunity + a concert ticket. Note: Please write Meet, Greet and Watch Westlife as the email subject. Step 3: Starting September 5, 2011 we will start uploading all qualified entries to Meet, Greet, and Watch Westlife Live Promo! album on our Facebook page. Step 5: On September 27, all entries who reached 500 votes or more will be judged based on the following criteria: Photo with Westlife album + merchandise 50% "Why you should win" explanation 50% Note: If only three (3) or less people reached the required number of votes / likes to qualify, they automatically win the grand prize. Step 6: Top three (3) entries with the highest score wins a Meet & Greet pass and a Westlife Live in Manila concert ticket each! Step 7: Winners will be announced via Odysseylive.net's Facebook Fanpage. All winners will be notified by an Odysseylive.net representative on how to claim their prize. Winners must be able to present at least 2 valid I.Ds. Note: Odyssey's decision is final. All negative comments to any promo participant will be deleted. Odyssey will not be liable in the event that Westlife's management cancels the meet and greet and / or concert. Click this for their fanpage! So yes, pls. win it for me. :P Thank you! Uwi kana todits bilisan mo! baka maunahan ka sa destiny mo?